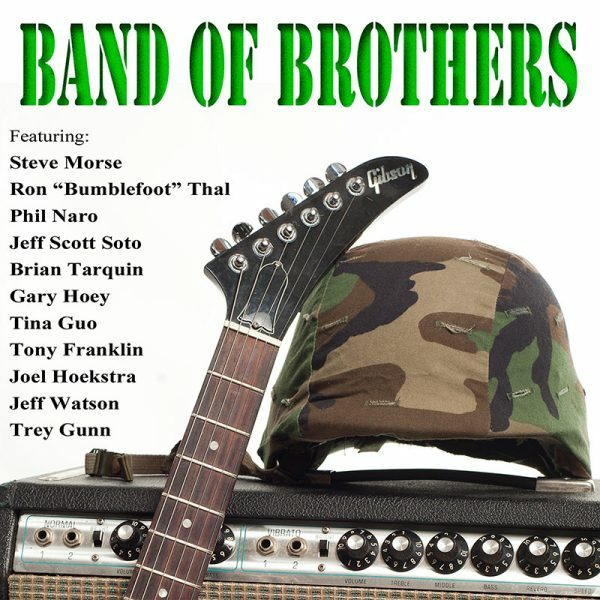 Award Winning Guitarist Brian Tarquin’s ‘Band of Brothers’ Album to Benefit Veterans – Cleopatra Records, Inc.
Award Winning Guitarist Brian Tarquin’s ?Band of Brothers? Album to Benefit Veterans Feat. Steve Morse, Trey Gunn, Bumblefoot, Jeff Scott Soto, Gary Hoey, Jeff Watson, Tony Franklin and others! From the producer of ?Guitars For Wounded Warriors,? Multi-Emmy award winning guitarist/composer Brian Tarquin has a new project featuring a host of superstar guitar virtuosos out on Cleopatra Records on July 7. Band of Brothers, was formed with singer Phil Naro (Talas, Julian Lennon, Peter Criss) and drummer Reggie Pryor (Albert King). Tarquin produced, engineered and co-composed the album with Phil Naro, which features guest appearances by Jeff Scott Soto (Journey, Trans-Siberian Orchestra), Steve Morse (Deep Purple), Ron ‘Bumblefoot’ Thal (ex-Guns N’ Rose), Trey Gunn (King Crimson), Jeff Watson (Night Ranger), Joel Hoekstra (Whitesnake), Gary Hoey, Tony Franklin (Jimmy Page, Blue Murder) and Tina Guo (Al Di Meola). The album features exclusive tracks inspired by those military soldiers who have fought for their country. Partial proceeds from the sales go to the Fisher House Foundation, http://fisherhouse.org who supplies housing to veterans’ families while they are hospitalized. What better way to celebrate July 4th than with superb tribute to our veterans! Says Brian, ?My dad was a Marine in WW2 so I am very mindful of the sacrifice that men and women under go to keep us free. This is how I can show my appreciation to them through these compositions of music.? Multi-Emmy Award winning Brian Tarquin is an established top rate composer/guitarist. He has won 3 Emmy’s for ?Outstanding Achievement in Music Direction and Composition for a Drama Series? and has been nominated for an Emmy 6 times. In 2016, Tarquin’s release ?Guitars For Wounded Warriors? was nominated for Best Album by the Independent Music Awards, which showcases Tarquin’s guitar prowess along side such world-class shredders as Steve Morse, Billy Sheehan, Gary Hoey, Ron ‘Bumblefoot’ Thal (ex-Guns N’ Roses), Reb Beach (Whitesnake), Hal Lindes (Dire Straits), Chris Poland (Megadeth) and Chuck Loeb (FourPlay). In 2006 SESAC honored him with the Network Television Performance Award. Tarquin has graced the Top Billboard Charts with such commercial releases as: ?This is Acid Jazz, Vol. 2,? ?Sweet Emotions,? and ?Bossa Brava: Caliente? on Instinct Records, followed by several solo jazz albums, which charted Top 10 at Smooth Jazz Radio. Brian has appeared on 36 releases, selling over 140,000 records in his career.